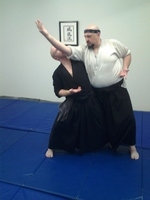 The School of Classical Japanese Martial Arts teaches a comprehensive system of empty-hand combat, consisting of Aiki ju jutsu and Atemi jutsu. Aiki ju jutsu literally translates as the yielding art of harmonizing with inner strength. 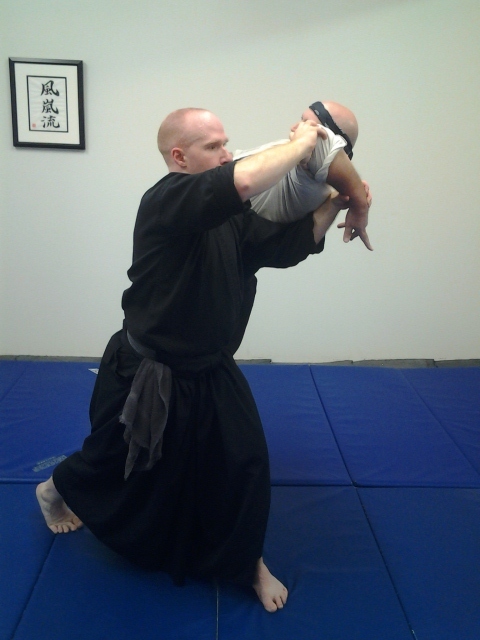 In practice, this includes throws (nage), leg sweeps (otoshi), and joint manipulations (seigyo). Throws and sweeps are used to cast an opponent to the ground, whereas joint manipulations are used to injure and incapacitate an opponent. Atemi jutsu is the art of striking an opponent with the hands, arms, and feet. The strikes used in this art are similar to strikes used in other martial arts styles. However, atemi jutsu is both a hard and soft art, meaning it uses hard strikes at some times, and soft strikes at others. Atemi jutsu is used in combination with aiki ju jutsu to make each art more powerful. 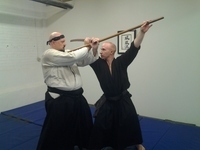 Weapon arts fall into two groups: ken jutsu, including all bladed weapons, and jo jutsu, which includes all blunt weapons. These arts use the same principles taught in the empty-hand arts. For safety, students will be qualified to attend weapons classes only after they are thoroughly familiar with the movements learned in the empty-hand classes. Ken jutsu is the art of bladed weapons. This includes weapons like the samurai sword (katana), the short sword (wakisashi), and the dagger (tanto), as well as more exotic weapons such as the naginata and nagamaki. The techniques of this art include blocking, cutting attacks, and disarming opponents. In general, techniques are practiced using wooden replicas of weapons. 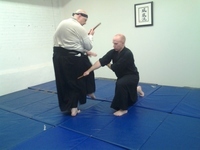 Advanced students use live blades. Jo jutsu is art of staff weapons. We organize staff weapons into three lengths: The daijo, which is 6 to 7 feet long; chujo, which is 4 to 5 feet long; and shojo, which is 2 to 3 feet long. The techniques of this art include blocking, striking attacks, throws, joint locks, and disarming opponents. Weapons such as the naginata, nagamaki, and yari are also part of the jo jutsu syllabus.